In May 2018, UC Davis met the eligibility requirements for designation as a Hispanic Serving Institution (HSI). As defined by the Department of Education a Hispanic-Serving Institution (HSI) is an institution of higher education that—(A) is an eligible institution; and (B) has an enrollment of undergraduate full-time equivalent students that is at least 25 percent Hispanic students at the end of the award year immediately preceding the date of application. Once designated an HSI, UC Davis will be one of only nine other campuses that are considered R1 universities, meaning they have the highest level of research activity for undergraduate and graduate students. Five of these R1 universities are also part of the University of California system. As of November 2018 there are 115 R1 universities in the United States. Over the last decade, UC Davis has developed dozens of programs that focus on outreach to and recruitment of economically disadvantaged students. It has established a series of student success centers, including one for Latinx and Chicanx students, to support, mentor, retain, inform and graduate students. The First Generation Initiative helps first generation students — who make up 46 percent of undergraduates and 72 percent of Chicanx and Latinx students — create a sense of connection, particularly through faculty and staff who are also first generation college students. Chancellor May formed a Task Force in June to help UC Davis define what success should mean for a research intensive, public land-grant, Hispanic Serving Institution (HSI) in California. You can find out more information about the Task Force and their activities here. The Task Force is currently engaging with our campus and extended community for guidance in this process and you are invited to offer your own thoughts at the link below. Please also take a moment to find out more about many of the Pioneros who labored over many years to help us achieve this distinction and read some of the Testimonios from members of the Task Force and community about what they see as the future of a HSI UC Davis. Title V of the Higher Education Act defines Hispanic-Serving Institutions (HSIs) as (A) an eligible institution; that (B) has an enrollment of undergraduate full-time equivalent students that is at least 25 percent Hispanic students at the end of the award year immediately preceding the date of application. Only US citizens and lawful permanent residents are counted for HSI designation. Institutions are eligible to apply for grants if they meet specific statutory and regulatory eligibility requirements. To be designated as an eligible institution of higher education, an institution must apply for and receive designation through an application process. How many HSI higher education institutions are in the United States? Fewer than 6% are research universities: 9 are R1; 8 are R2; 13 are R3. 34% (n=159) are in California, more than any other state (CA also has 56 emerging HSIs). UC Merced, UC Riverside, UC Santa Barbara, and UC Santa Cruz are current HSIs. UC Davis is an eligible HSI. UCLA and UC San Diego are emerging HSIs. Will UC Davis be eligible for additional funding with an HSI designation? The Hispanic-Serving Institution moniker comes from Title V of the Higher Education Act of 1965. It is a federal response to historic underfunding of education for Hispanic students. The Act directs the federal government to “provide grants and related assistance to Hispanic-serving institutions to enable such institutions to improve and expand their capacity to serve Hispanic students and other low-income individuals.” In addition to Title V funding, Hispanic-Serving Institutions often have priority funding under Title III, other federal agencies (e.g. USDA or NSF), and even private organizations and donors. This is important, because as the number of Hispanic-Serving Institutions have grown exponentially over the past 20 years, Title V funding has remained flat. All of these opportunities are very competitive. Not only is funding not guaranteed, but it is only available to those institutions who show a clear understanding of their strengths and weaknesses as an organization, and of the needs and values of their students. How many Hispanic/Chicanx/Latinx students are enrolled at UC Davis? Based on eligible citizens and residents, 25.3% of UC Davis undergraduates count toward federal HSI eligibility. UC Davis and UCOP use different definitions (different combinations of the race/ethnicity, residency, and citizenship questions on the undergraduate application) to define our Hispanic/Latinx/Chicanx population. According to UC Davis numbers from 2017, there were enrolled: 6,318 undergraduates (30,066 all ethnicities), 35 Postbaccalaureate (146 overall), 706 graduate (7,168 overall). Of those students there are 42.6% low income (26% all UCD); 70.8% first generation (42% all UCD); 65.6% female (59% all UCD); 78.0% identify as MexicanAmerican/Mexican/Chicanx (Of all California Hispanic: 84%); 22% identify as Latinx/Other Spanish (Of all California Hispanic: 26%); 35% transfer (36% all UCD). UC Davis also has more than 20,000 alumni who identify as Chicanx and Latinx, most of whom still live in California. How long has UC Davis' Hispanic enrollment been growing? Since 2008, UC Davis has nearly tripled the number of Chicanx/Latinx students who apply to UC Davis as freshman or transfers (2008: 7409, 2017: 19486), and more than doubled its enrollment of those applicants (2008: 989, 2017: 2169). The dramatic increase is not a fluke of demographics, but an intentional strategy by UC Davis admission and recruitment staff to attract top students, draw from new regions of California, and strengthen the UC Davis brand among key influencers. What recruitment and admissions best practices and policies did UC Davis adopt to gain HSI status? UC Davis is a destination of choice for Chicanx/Latinx students. While Chicanx/Latinx students have a lower acceptance rate (37%) than the entire student pool (42.8%), our Chicanx/Latinx students exhibit a higher yield rate (28.5%) than our general student population (23.7%), which ensures that their overall admissions rate (10.5%) remains aligned with the admissions rate of the general student population (10.0%). The number of applications from Chicanx/Latinx students have increased dramatically in the past ten years. The same is true for low-income students. Even as applications have increased, the number of admits and enrollees has increased at a much slower pace. 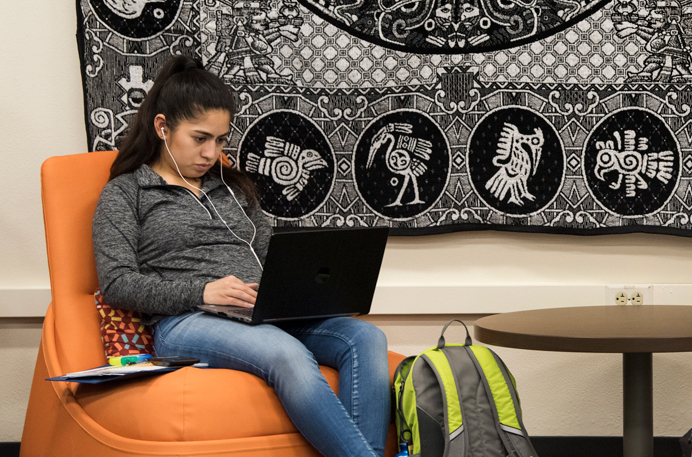 The increase in the proportion of Chicanx/Latinx students has been the result of UC Davis' ability to attract Chicanx/Latinx students who meet the high standards of admission to the University of California system. - Diversify the regional pool of our applicants so that UC Davis attracts the top Chicanx/Latinx applicants from places like the Imperial Valley and Salinas rather than drawing from the same pool as other institutions. - Create a strong brand and reputation with high school counselors, superintendents, and other school influencers to encourage applications and enrollment. - Expand traditional events to include Chicanx/Latinx parents/caretakers and community influencers. - Host a variety of Yield Activities throughout the state and on campus for Freshman. - Host several hundred Chicanx/Latinx, African-American and Native American Transfer students as part of Transfer Decision Day. - Increase social capital with Chicanx/Latinx students through hosting visits that showcase UC Davis’ intentional support mechanism and programs to guarantee their success and graduation. For an explanation of how applications are evaluated at University of California see: http://admission.universityofcalifornia.edu/freshman/how-applications-reviewed/index.html and https://www.ucdavis.edu/admissions/undergraduate/freshman/selection-process. What does it mean to focus on Hispanic/Chicanx/Latinx students at UC Davis? In 2017, UC Davis was ranked ninth by Washington Monthly magazine for universities with contributions to the “public good.” The magazine defined “public good” as social mobility (recruiting and graduating low-income students), research (producing cutting-edge scholarship and Ph.D.s) and service (encouraging students to give something back to their country). In 2015, The New York Times ranked UC Davis as No. 2 on its list of universities serving as an “upward-mobility machine” for students (the other UC campuses rounded out the top five). The ranking is based on the share of students receiving Pell Grants, graduation rates, and net cost to students of middle- and low-income families after receiving financial aid. "to serve society as a center of higher learning, providing long-term societal benefits through transmitting advanced knowledge, discovering new knowledge, and functioning as an active working repository of organized knowledge. That obligation, more specifically, includes undergraduate education, graduate and professional education, research, and other kinds of public service, which are shaped and bounded by the central pervasive mission of discovering and advancing knowledge." As a land grant institution, UC Davis has a responsibility to address these issues and impact the well-being of residents in our state. Might the HSI initiative galvanize the campus around addressing stubborn issues of retention and inequity that persist in our institution? Research has shown that the institution needs to recognize the part it plays in continued disparities in outcomes based on demographics. In the end, all students benefit from such an approach. HACU, National Institute for Latino Policy, Pew Research Center Image Credit: Urban Archives Center Latino Cultural Heritage Digital Archives Frank del Olmo Papers. California State University, Northridge. Oviatt Library. Salkind, N. J. (2008). Cultural deficit model. In Encyclopedia of educational psychology (Vol. 1, pp. 217-217). Thousand Oaks, CA: SAGE Publications, Inc. doi: 10.4135/9781412963848.n60; Garcia, Gina A. and Okhidoi Orgonjargal (2015) “Culturally Relevant Practices that ‘Serve’ Students at a Hispanic Serving Institution.” Innov Higher Educ 40:345-357. See also: Terenzini, Patrick T. et al. (1995) “Making the Transition to College” in Menges, Robert J. Menges, Maryellen Weimer, and Associations, eds., Teaching on Solid Ground: Using Scholarship to Improve Practice. Jossey-Bass. pp. 43-73. Engle, J., Tinto, V. (2008) “Moving Beyond Access: College Success For Low-Income, First-Generation Students.” Pell Institute.